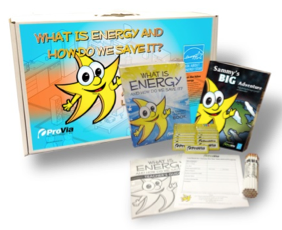 ProVia's Sammy the Star Educational Program get kids excited about saving energy…and can boost your brand too. Sammy the Star Wows the Kids…Again! Sammy the Star continues his 2016 tour of the U.S. and he keeps picking up fans along the way. 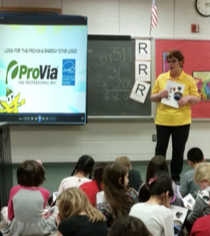 At a recent stop in Virginia, Sammy brought his ENERGY STAR Education Program to third graders at Centreville Elementary, part of the Fairfax County Public School system. ProVia dealer Thompson Creek Window Company was our local sponsor for this event, and classes were taught by Wanda Angel (ProVia) and Sherri Newman (Thompson Creek). Once again Sammy, with a little help from his posse from ProVia, was a hit with the kids! They were so excited to learn about saving energy. The program was such a success, that additional classes are being taught through October 2016. By continuing this program with their local school system, Thompson Creek has developed a strong relationship with educators, kids and their families. This has given their brand awareness a big boost in their own backyard. There is some time involved in supporting this program, but other than that, it's a remarkably low-cost way to get your name out there. Feel free to email me if I can help you bring Sammy The Star to your hometown.